(Nanowerk News) Researchers at the University of Liverpool have made a discovery that could improve the conductivity of a type of glass coating which is used on items such as touch screens, solar cells and energy efficient windows. Coatings are applied to the glass of these items to make them electrically conductive whilst also allowing light through. Fluorine doped tin dioxide is one of the materials used in commercial low cost glass coatings as it is able to simultaneously allow light through and conduct electrical charge but it turns out that tin dioxide has as yet untapped potential for improved performance. In a paper published in the journal Advanced Functional Materials ("Self-Compensation in Transparent Conducting F-Doped SnO2"), physicists identify the factor that has been limiting the conductivity of fluorine doped tin dioxide, which should be highly conductive because fluorine atoms substituted on oxygen lattice sites are each expected to give an additional free electron for conduction. The scientists report, using a combination of experimental and theoretical data, that for every two fluorine atoms that give an additional free electron, another one occupies a normally unoccupied lattice position in the tin dioxide crystal structure. Each so-called "interstitial" fluorine atom captures one of the free electrons and thereby becomes negatively charged. 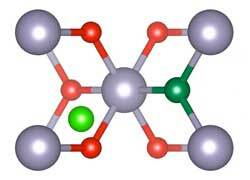 This reduces the electron density by half and also results in increased scattering of the remaining free electrons. These combine to limit the conductivity of fluorine doped tin dioxide compared with what would otherwise be possible. PhD student Jack Swallow, from the University's Department of Physics and the Stephenson Institute for Renewable Energy, said: "Identifying the factor that has been limiting the conductivity of fluorine doped tin dioxide is an important discovery and could lead to coatings with improved transparency and up to five times higher conductivity, reducing cost and enhancing performance in a myriad of applications from touch screens, LEDs, photovoltaic cells and energy efficient windows." The researchers now intend to address the challenge of finding alternative novel dopants that avoid these inherent drawbacks.